Asian economies are becoming more resilient externally, but sputtering economic growth is weakening them from within. Over the past year, the region’s economies have beefed up their external defences. Trade balances have improved by 4 to 8 percentage points of GDP in India, Malaysia and Thailand. When exports grow relative to imports, more liquidity finds its way into local financial systems. The exchange rates for Indonesia, India, Malaysia and the Philippines, after stripping out the effects of inflation, are also more competitive than before the summer of 2013, when it looked like a move to tighter monetary policy in the United States would cause capital flight from Asia. Growth, though, is faltering. Even after reporting on-target 7.5 percent GDP expansion in the second quarter on July 17, China is expected to grow at its slowest pace this year in more than two decades. The malaise is broad-based. At the start of last year, economists’ consensus forecast for 2014 GDP growth in Asia averaged 7 percent. That has fallen to about 6 percent, yet expectations for large advanced economies are roughly intact. Worryingly, the slowdown is occurring amidst a large overhang of debt. Since 2007, the ratio of credit-to-GDP has doubled in China and Hong Kong, expanded by almost 50 percent in Singapore and grown more than 30 percent in Thailand and Korea. Lower domestic interest rates can help growth in some places, particularly in Korea and India. But as a region-wide strategy, that’s too risky. For savers, bank deposits already pay very little compared with inflation. It’s only in China that real rates on deposits have improved significantly since 2007; and that’s because inflation in China is rather muted now. If Asian interest rates drop, the lure of real assets like property will become stronger. Credit would zoom further. That could store trouble for the future. Hong Kong and Singapore have struggled to rein in property mania by using “macroprudential” curbs on real-estate borrowing and lending. Given the uncertain efficacy of these tools, most Asian central banks may not risk cutting interest rates. The region’s best hope is an upturn in export-driven investment. For that, rich nations’ demand shortfall will need to end, and quickly. Without a revival in internal strength, Asia’s external stability could be illusory. China’s GDP grew 7.5 percent in April to June from a year earlier, accelerating for the first time in three quarters, according to a statistics bureau report on July 16. The consensus forecast by economists of 7.3 percent growth in 2014 would be the slowest since 1991. 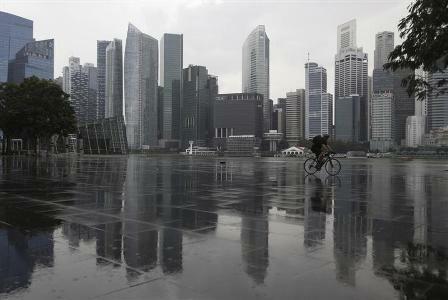 Singapore’s economy unexpectedly shrank an annualized 0.8 percent in the second quarter from the previous three months, government data released on July 14 showed.